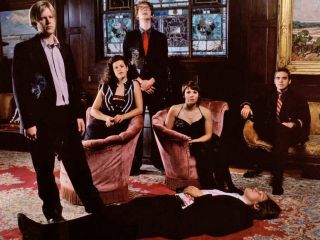 Arcade Fire have written the music for The Box, the forthcoming movie from Donnie Darko director Richard Kelly. Arcade Fire frontman Win Butler told Pitchfork, "It's kind of Hitchcocky, movie, orchestral, Mellotron stuff. It's instrumental music. No songs. It's interesting. "We didn't really think we were going to do the whole thing, and then it just kind of was easier once we got in… It has so much to do with the editing, and your job is just to help the director. It's a very different experience." The Box isbased on a Twilight Zone episode set in the 1970s. "It's got this kind of sci-fi, kind of Alfred Hitchcock feel," Butler continued. "Those Hitchcock scores are some of my favorite movie music. We have a Mellotron, and since it's the '70s, it really seemed to fit. It was just really easy to imagine the type of music that would help the movie. "It was a very ego-less project. The goal was to kind of bang some music out and not be, like, slitting our wrists over if the tambourine is too loud." Loud tambourines - definitely not worth getting suicidal over.